We rely on Health Professionals and Advisors to inform their patients and clients about our services, in case they are needed now or in the future. 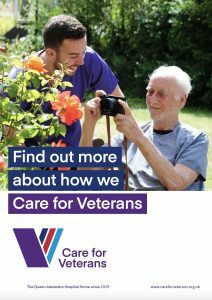 We encourage you to come and visit Care for Veterans so that you can see our facilities for yourself; this is the best way to appreciate our homely, friendly and professional environment. Alternatively, we can come to you and give a short presentation about who we are and what we do. To arrange a tour, visit or presentation, please call us on 01903 213458. General Information Brochure – this A4 brochure includes information about all of the care and rehabilitation services we provide, and details on how to become a resident. 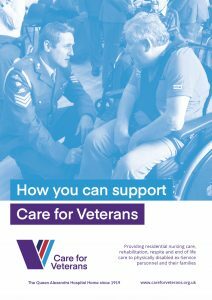 How to Support Us – this A5 leaflet tells you all the ways you can support Care for Veterans, from fundraising to volunteering. 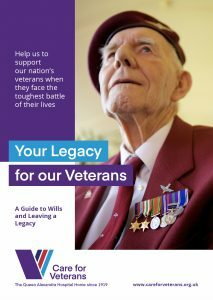 Your Legacy to our Veterans – an A5 leaflet explaining how to you can leave a lasting Legacy to help our veterans.